This type of lineup would make the even the biggest of hedonists and gourmets light headed (we definitely were when we saw the invite), and we refused to miss this event for the world. We arrived early, anxiously waiting for the event to start, and were let in promptly at 6pm for the reception. Almost immediately after checking in our coats, we were offered to start the night with a ‘99 Barolo (you’re kidding right?!). We knew we were in for quite the experience, because on any other night, the ‘99 Barolo would be considered a highlight, not a starter. 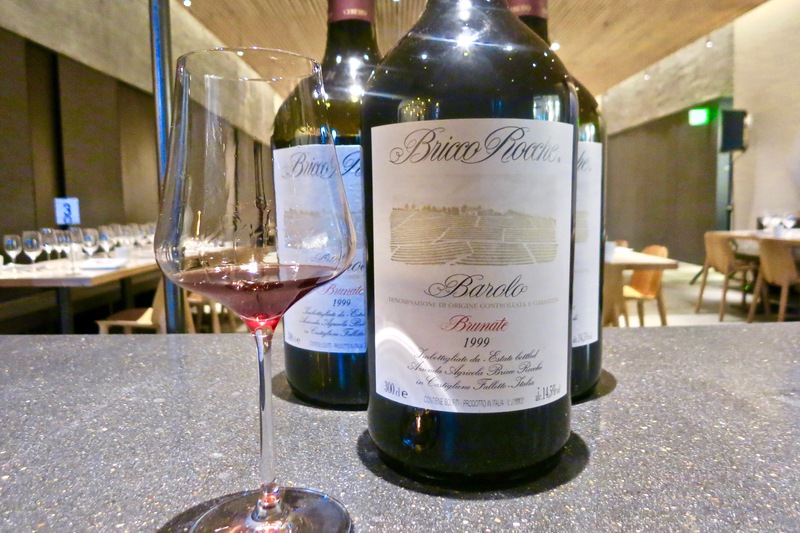 Bricco Rocche 1999 Barolo – poured out of a 3L bottle, the aromatics were incredible and seductive. Notes of blackberries, smoke, dusty mushrooms, dried roses, exotic spice, dark cherries, cedar, licorice, orange peel, and leather. The palate is refined and balanced with matured dark fruit, earthy undertones and spice. The mouthfeel is still very fresh, smooth tannins, and a length finish. Elegant, complex, and harmonious, beautiful out of the bottle. We gave this 96 points at $150/bottle(750ml). During the reception, we were able to sample a few of the Canapes from the chefs. There was a mad dash for the food every time a tray came out, and it seemed most people here were for the chefs. Luckily for us, that meant more refills of the ‘99 Barolo. We did eventually get to grab a few bites, and they were as expected…excellent. 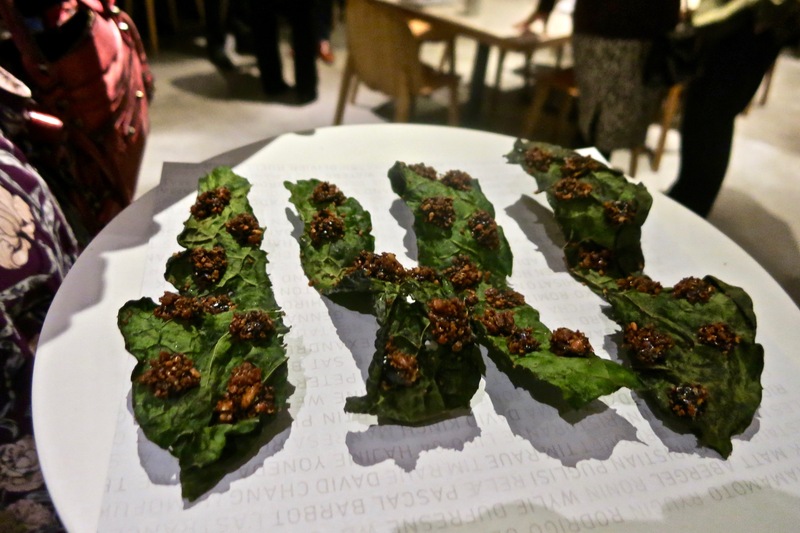 This reminded us of ants on a log when we looked at it, but we really enjoyed the toasted kale, the texture was fantastic between the delicate crackle of the kale, and the richness and density of the truffle and rye. 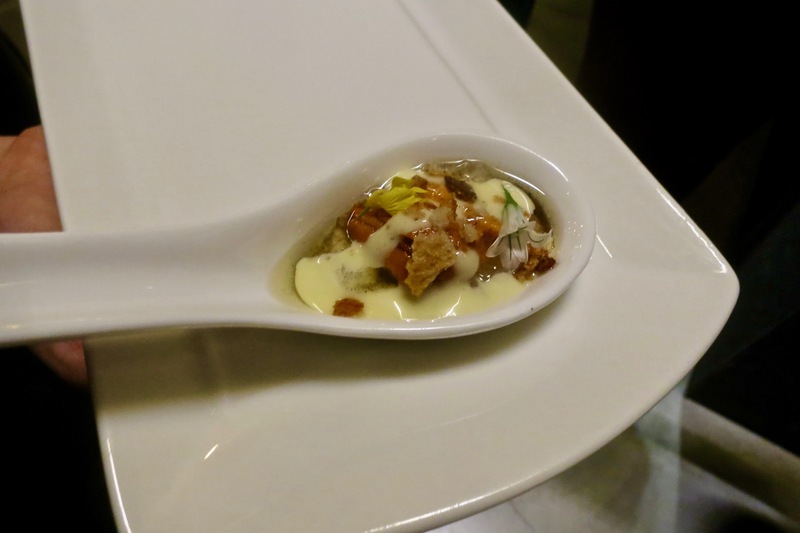 We really enjoyed the single burst of flavor that came from this spoon, from the delicate floral notes of the flowers to the richness of the meat and creamy texture of the sauce. 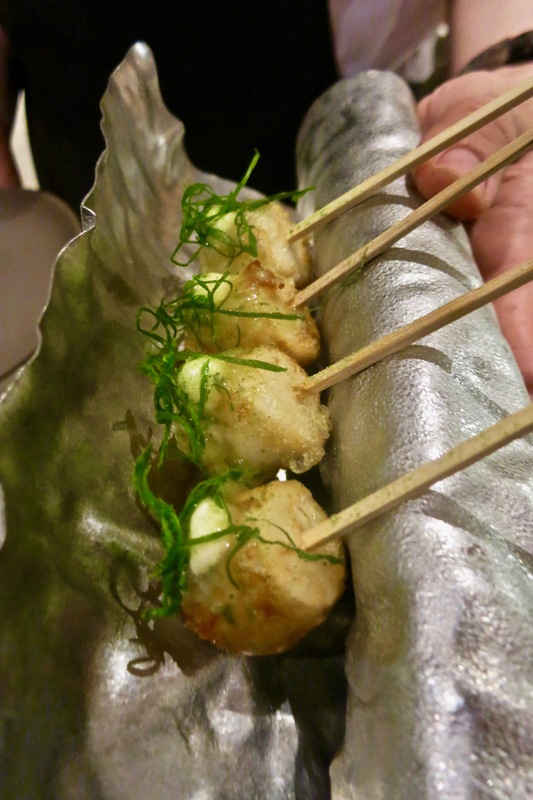 We loved everything about this take on common asian street food, with the added aromatics and cream and lightly fried, the fish cake was elevated and a great one bite popper. As the reception ended and we sat down at our seats, we were welcomed by none other than Federico Ceretto (Son of Bruno) and Roberta Ceretto (Daughter of Bruno). They gave us the brief history of the Ceretto family and their montage, but also reminded us that tonight was a night to celebrate art (we surely wanted to celebrate the wine the most). Corey Lee came out to greet and thank us all for coming, and just like that, our meal began. We started off with some sourdough bread as expected (San Francisco’s sourdough culture is among the best), with some cultured butter. Nothing too unexpected here, just really good sourdough, and the butter was decadent and creamy. We were able to wash it down with a glass of Blange. 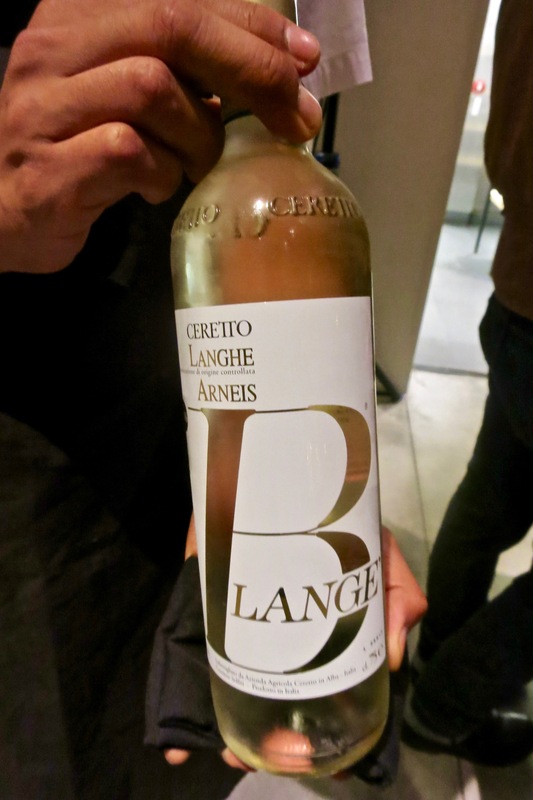 Lange D.O.C Arneis Blange – 100% Arneis grape, this was the perfect refreshing starter to the meal. Notes of citrus blossom, orange peel, warm spice, apricot, starfruit, and passion fruit. The palate starts extremely crisp and bright, but smooths out on the finish and the sweetness of stone fruit really comes to play. An exciting and fun wine, we gave this 92 points at $29/bottle. 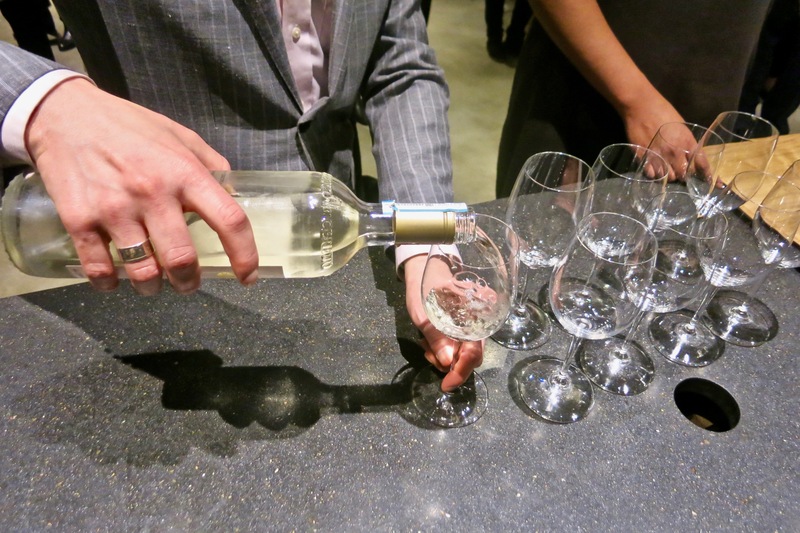 This was so good to drink that we emptied our glass rather fast, but got a refill of the Arneis, and shortly after the first dish of the night came. Daniel Patterson’s (Coi) dish was first, and he chose to create a dish inspired by Agnes Martin, “Untitled from On a Clear Day” 1973. He spoke how this piece inspired him based off the similarity of art technique, and how it was to be mastered based through repetition and practice. 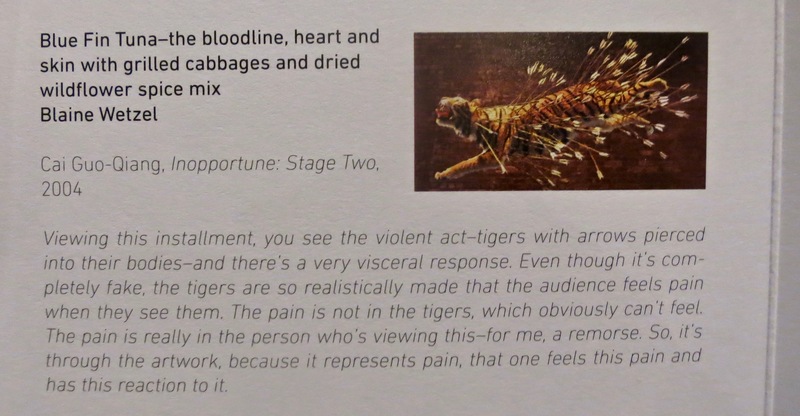 He noted that when we looked at the artwork, it seems like everything is perfect lines, but if we were to dive deeper, we would see the inconsistencies. His dish was called “Asparagus” and it absolutely delivered. Upon first glance, we had initially thought the plates were created this way with uneven lines in them,, but it wasn’t until we started removing the pieces that we saw the lines had been drawn into the plates! 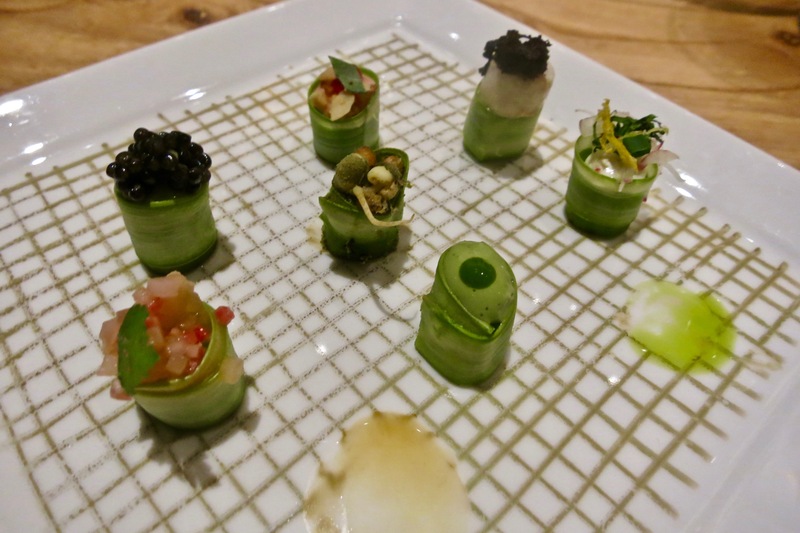 Each bite was a thin sliver of asparagus, but every filling was different. 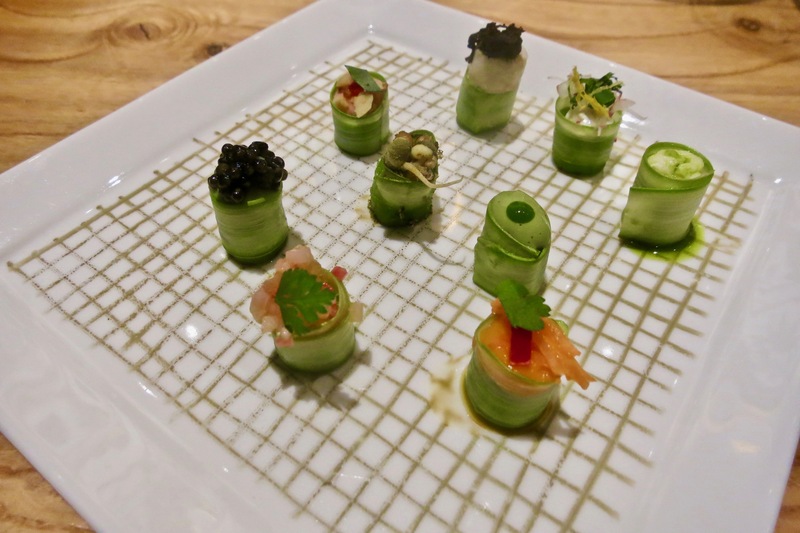 From caviar, to vegetables, fish and mousse, each bite was a burst of flavor that lingered on the palate to be never experienced again. Needless to say, the wine paired extremely well, with the refreshing citrus acidity and stone fruit sweetness supporting this very bright and focused dish. The next dish was from Enrico Crippa (Piazza Duomo). This was a highly anticipated moment, as he was arguably the star chef of the night. 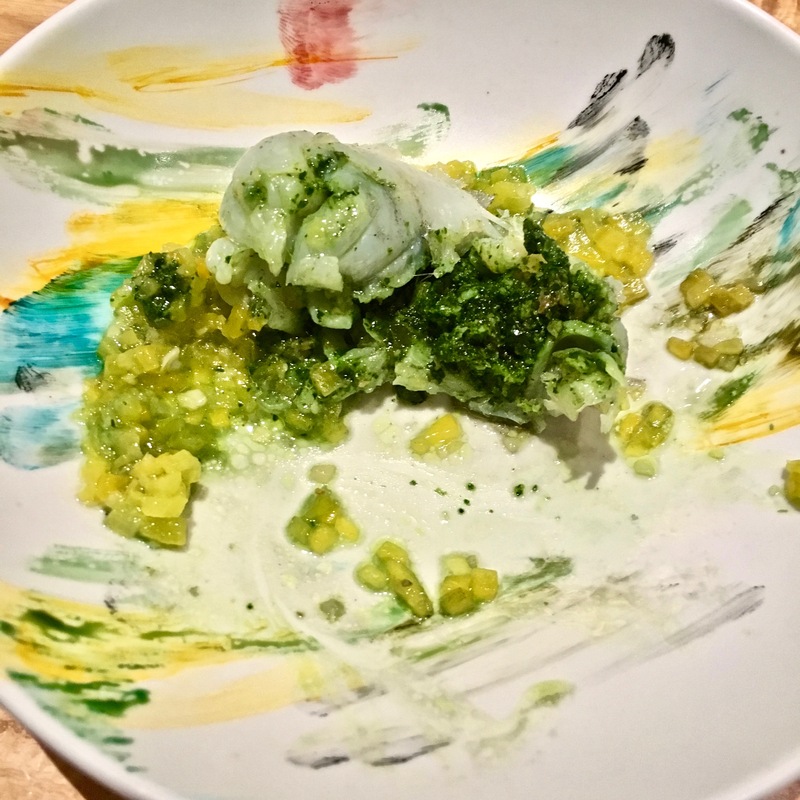 He went on to describe his dish was inspired by the colors presented in Francesco Clemente’s piece, “Food from Fifty-one Days on Mount Abu” 1993 and he wanted to bring the colors back into a classic Piedmontese dish. The dish came out like a true piece of art, named “Anchovies and Green Sauce” was almost too pretty to eat. 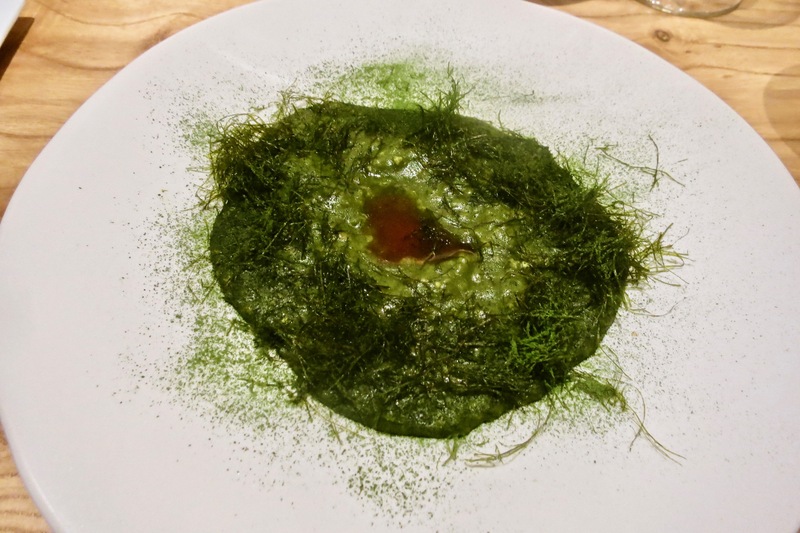 Cutting into the center, it was reminiscent of an asian dumpling, and inside gushed out a savory mixture of anchovies coated in a green herb sauce. 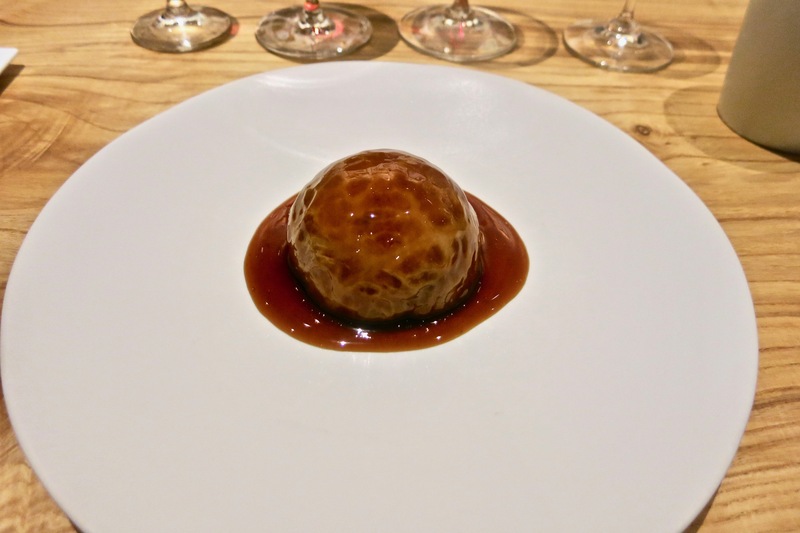 The dish itself tasted amazing, texturally there was the thick gelatinous skin of the dumpling (very similar to a ba-wan which is a popular chinese dish), and the anchovies as well as the vegetables were not overcooked so they offered a soft crunch of texture and not mush. Savory and well seasoned, it gave a rather dense meaty texture, and it was absolutely satisfying. We received our next wine pour, with Federico coming forward and actually admitting, that prior to this event, the chef’s never told him what the dishes were going to be, so he had no idea what wine to bring. That being said, he opted that a California audience would like something big, and he decided to bring a Rosso. 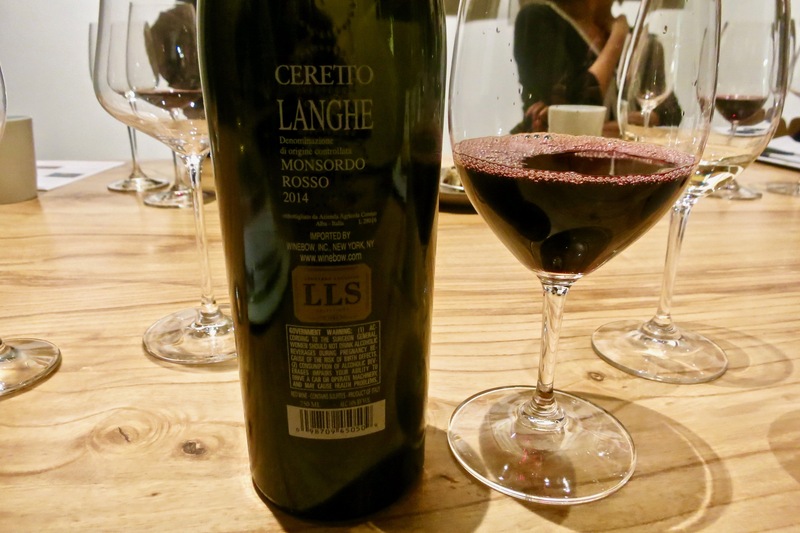 Ceretto 2014 Monsordo Langhe Rosso DOC – He certainly was right about the wine being big, and we really enjoyed it as well. Distinct earthiness aromatics, notes of vanilla, oak spice, cedar, raspberries, red cherries, red currant and underbush. The palate showcased sharp red fruits, with the right amount of bramble and dusty underbrush. Acid soared throughout, and the length was spectacular. We gave this 93 points at $40/bottle. 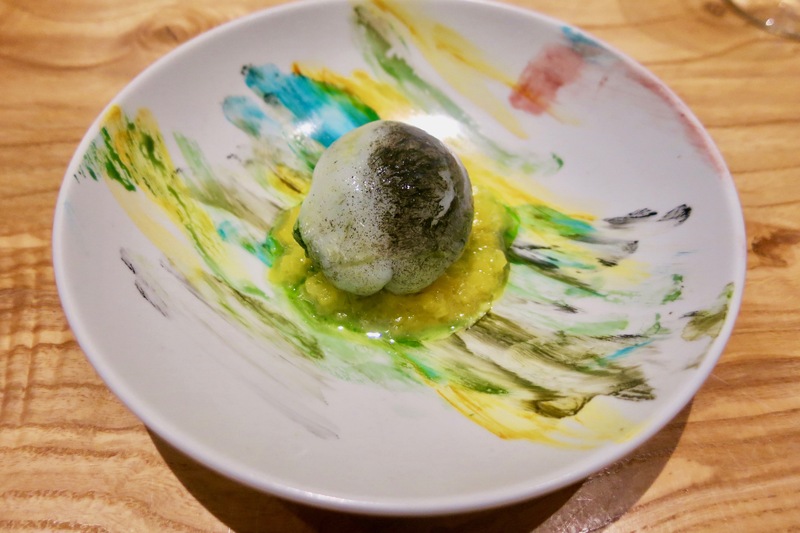 The following dish was Blaine Wetzel’s rendition of Cai Guo-Qiangs piece Inopportune: Stage Two” 2004. To be honest this was the dish we were most interested in seeing, after glancing over the menu. Such a tragic looking yet beautiful in its own way piece of art, we had high expectations for the dish. Chef Wetzel (Willows Inn) went to go on and say his inspiration was from the reaction he got to this piece, which was an overwhelming feeling of pain, and he wanted to portray that into the dish. He did clarify that he wanted to make sure that we did not feel pain physically (the audience had a good laugh about that), but hoped we would see the artistry through his dish. He opted to go with very uncommon pieces of Tuna, which were often discarded or as scraps due to uncommon use or usually not visually appealing. The dish definitely had a dark aura to it, and the dish almost seemed moody. It was titled “Blue Fin Tuna” It was quite the contrast to the green and vibrant dishes we had started out with, but in a sense, the contrast really helped portray a dark mood. 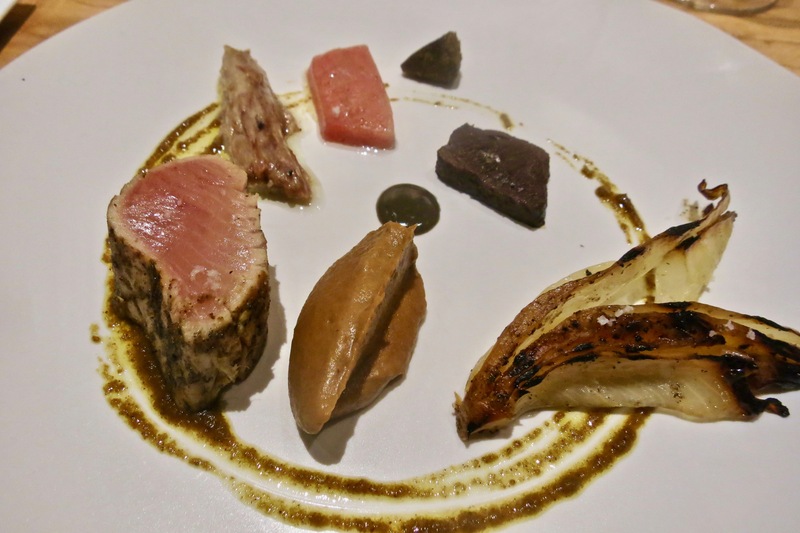 We really enjoyed this dish as well, from the iron an really dark metalic taste of the bloodline, to the char of the vegetables and the sliminess/fattiness of the skin, and the regular parts of the tuna that we all come to enjoy. We felt like wine surprisingly matched pretty well, due to the fatty and deep richness from the fish skin, and iron-like minerality from the bloodline. It almost gave a red meat characteristic that was well supported by the tartness and boldness of the Rosso. 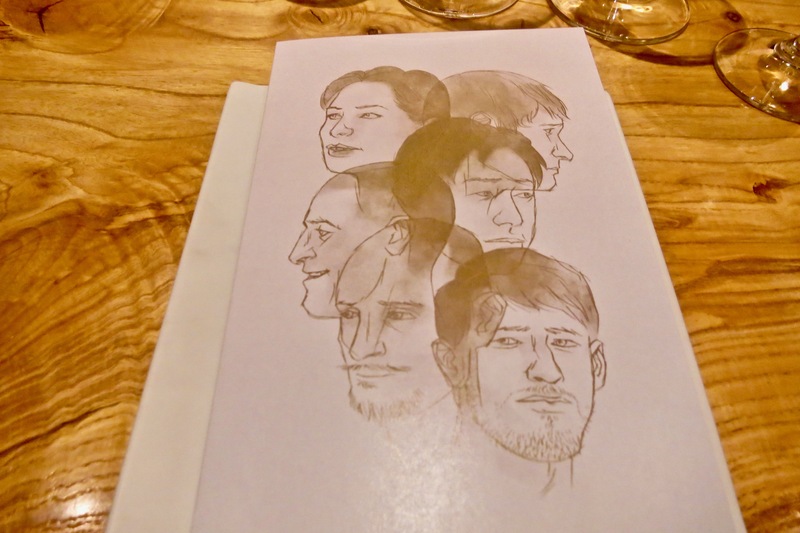 Corey Lee (Benu) was next, and he described his dish to be an inspiration not only from art, but from a dish that Enrico Crippa had made before. 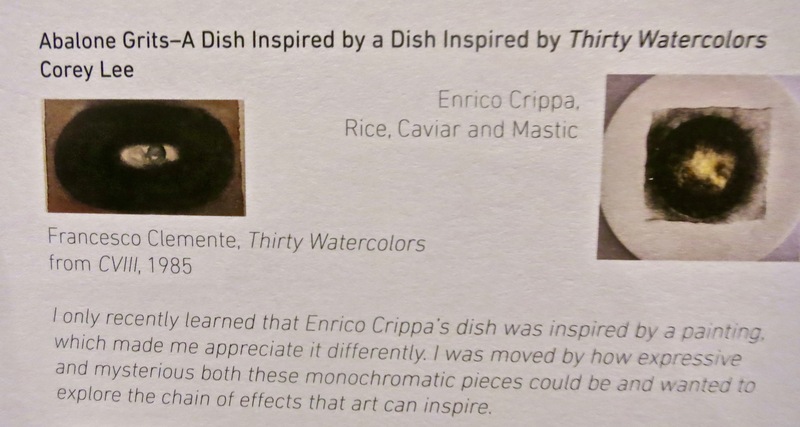 Enrico’s dish which he had made in the past “Rice, Vaviar and Mastic” was inspired by the Francesco Clemente’s piece, “Thirty Watercolors from CVIII” 1985. Although at first, it wasn’t extremely visually appealing compared to the rest, we had to remember that art is to be interpreted differently. Needless to say, even if the dish wasn’t visibly a stunner, the taste absolutely was. 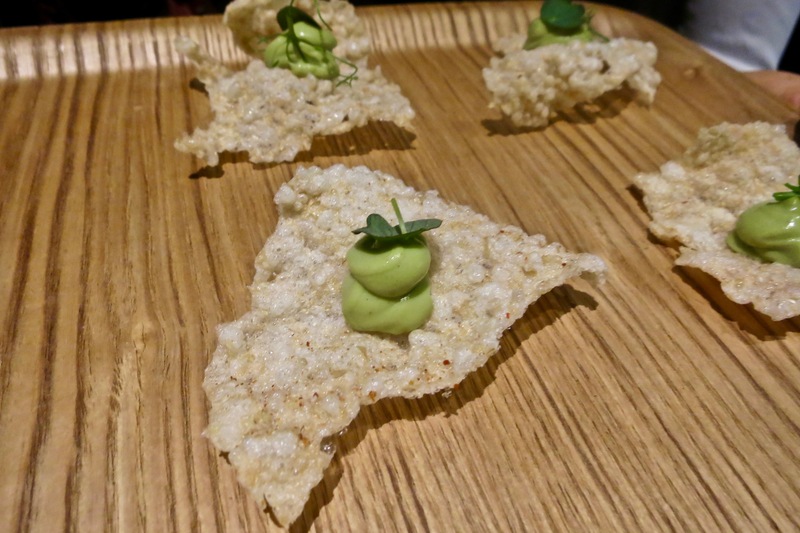 Creamy grits, with savory herb dusting, and probably the most tender abalone we had ever had. 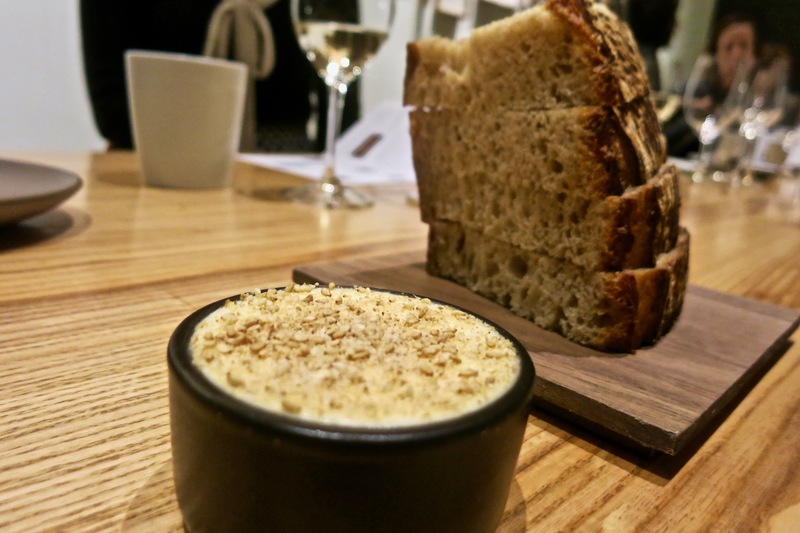 The dish was a punch of savory and creaminess, it had great weight to it. For something that looked not so appetizing, it was hard not to lick the plate. Absolutely delicious. 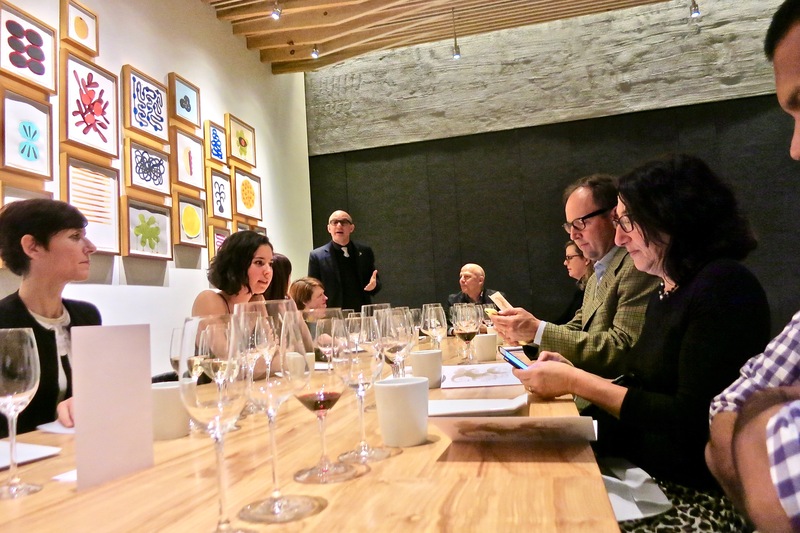 Brandon Rogers (In Situ) was the final savory course, and his dish was inspired by Tauba Auerbach’s painting, “Crumple II” 2008. Chef Rogers was a man of few words, he briefly explained that he hoped to achieve the same level of layered techniques that was shown in the painting (literally in and out of the room in less than 30 seconds). Upon further inspection of the painting, you could see that really it does look like a piece of crumpled paper, and the level of meticulous skill that had to go in it to give it that effect. Chef Rodger’s dish was called “Chicken Crepinette” actually quite visually appealing in its simplicity as it came out. It had a beautiful gloss, it was round and spherical, pretty and elegant. Right before cutting into the dish, we received our next wine, and Federico gave us a brief intro into how every Barolo dream is to come from the hills of Cannubi. He poured the wine out of magnums, and of the very few made, during this night we consumed 5% of the worlds production. What a treat! 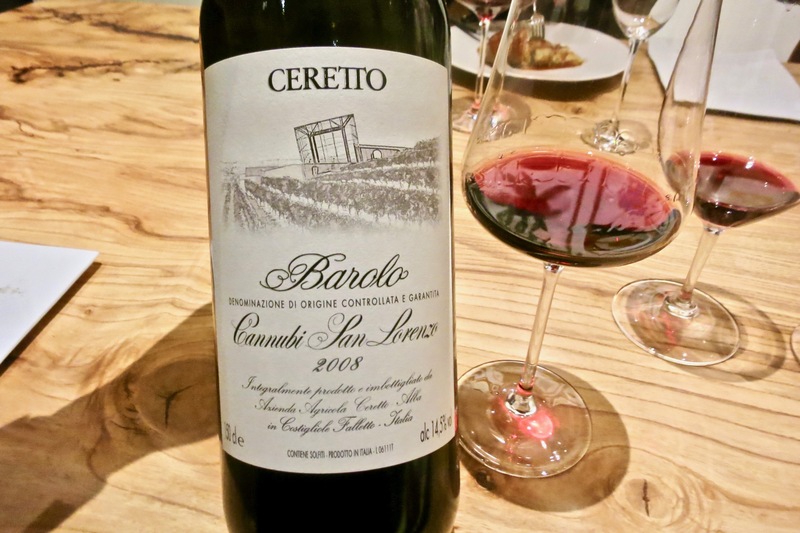 Ceretto 2008 Barolo Cannubi San Lorenzo – As expected with a younger Barolo, the aromatics were intense and perfumed. Notes of dried red florals, tobacco, red cherries, raspberries, anise, licorice, cedar, and bitter chocolate. Incredible persistence on the palate and lively intencity, ripe red fruit with spicy-earthy undertones and a huge backbone of acidity. Outstanding persistence from start to finish and beyond. Incredible wine that can only get better from here. We gave this 97+ points for $900/Magnum(1.5L). After savoring this incredible Barolo for just a bit, we cut into our dish. Absolutely gorgeous layers of chicken, vegetables and rice, the flavors were hearty, the chicken was cooked perfectly and texturally the dish was whole. Just visually, you could tell the amount of work and technique needed to pull off this dish. 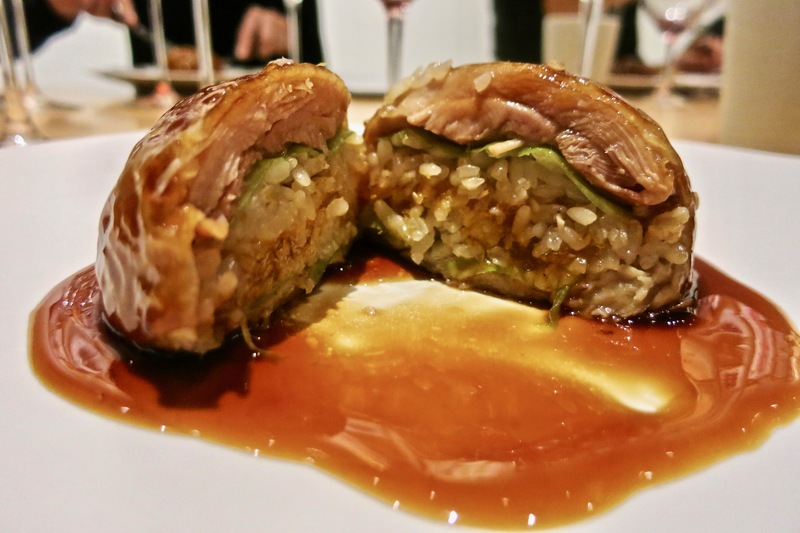 The sauce really was the big ticket for us, it enveloped the dish in rich savoriness, and really binded the classic flavor of chicken and rice together. This paired extremely well with the Barolo, but then again, when you were pairing with such an excellent wine, it was hard to not have it work out. Our last wine was served to us signaling the call of the dessert courses, and not surprisingly, the wine was Moscato d’asti. 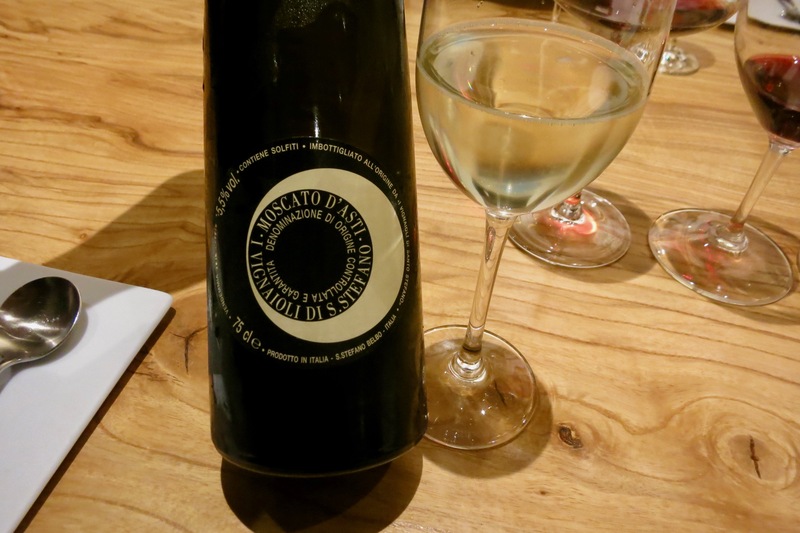 Ceretto 2016 I Vignaioli di S. Stefano Moscato d’Asti – sweet notes of pear, white flowers, peach, lychee, pineapple, cumquat, green apple and citrus peel. Heavier palate than expected and dominant of tropical fruits. The bubbles add some much needed texture balance, keeping the wine from not being overly cloy, and slight acidity comes through. Low alcohol, definitely a crowd pleasing wine no doubt. We gave this 89 points at $29/bottle. Belinda Leong (B. Patisserie) needed no introduction, as her shop B. Patisserie is a well loved place by tourists and locals alike. Most people were already excited for her desserts before she even started talking. Chef Leong went on to describe that she really loved a piece currently in MOMA, the piece by Celeste Boursier-Mougenot, “clinamen v.3” 2012-ongoing. 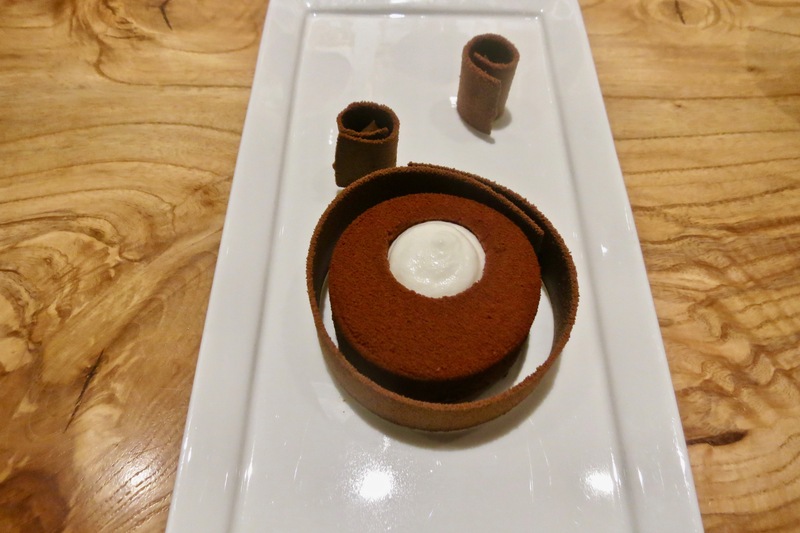 She loved it for its simplicity and beauty and she wanted to recreate it in dessert form. Needless to say, the staff had a little trouble bringing it out, but what was plated in front of us was nothing less than a masterpiece. 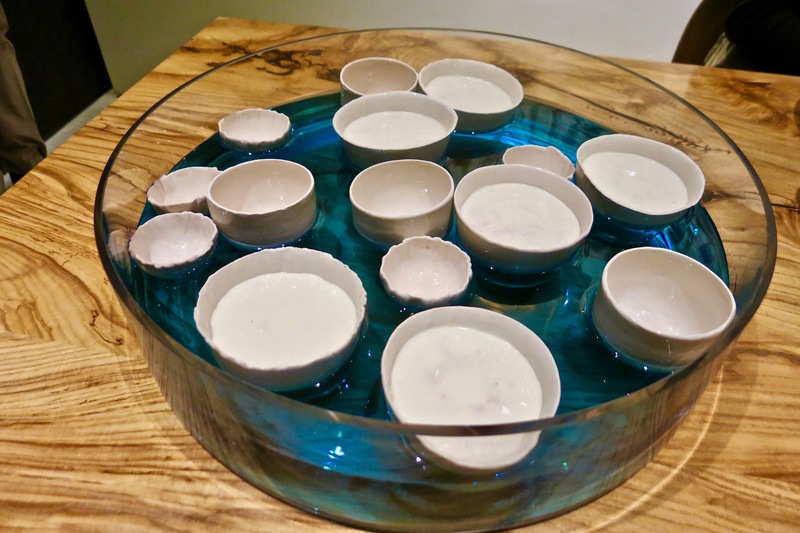 The dish literally looked like the art, and even had the soothing sounds of the bowls clinking together (an experience you get from the piece in MOMA). The dish was called “Yogurt citrus” and just like the visuals, it was amazing. 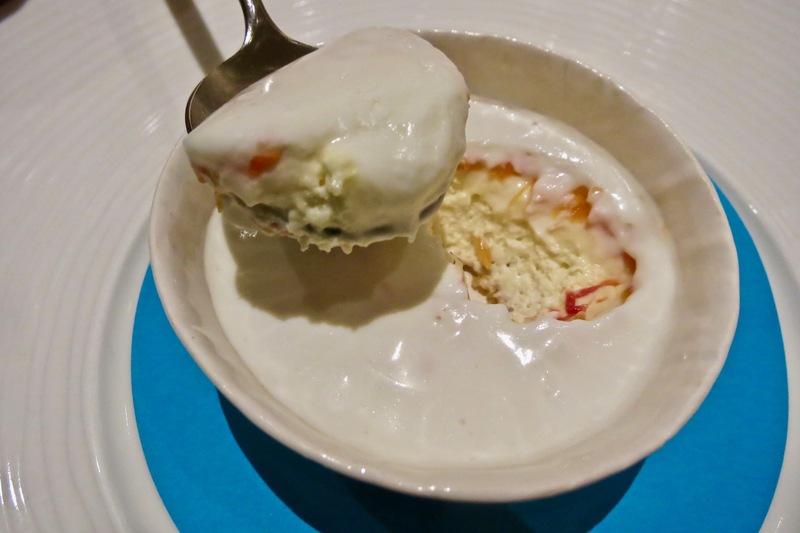 The right amount of candied citrus and acidity, slight crunch from the granola, and the yogurt was smooth and creamy, really making each bite a delight. The wine paired fairly well with the dish, although the dish did outshine the wine a little bit, but the flavors worked well, probably would’ve been better had the wine been a little more rich. The last dish that Belinda brought out to close out our meal was inspired by an installation done by Richard Serra, “The Matter of Time” 2005. 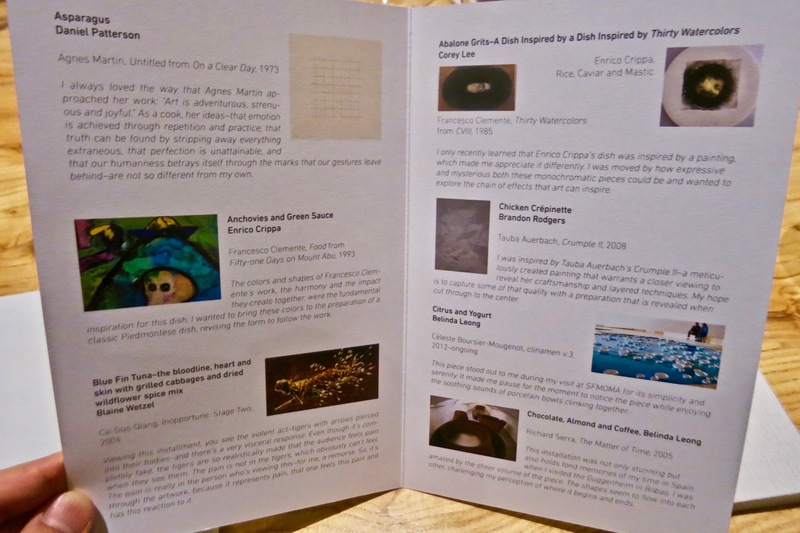 The dish was well executed, and again looked very similar to the art piece itself, more of a copied inspiration rather than interpretation. The cake was rich, heavy layers of dark chocolate and coffee with the almond mousse binding everything together and adding richness. The bands of chocolate were a delight and everything was heavily coated in chocolate powder to give a rather interesting textural mouthfeel. 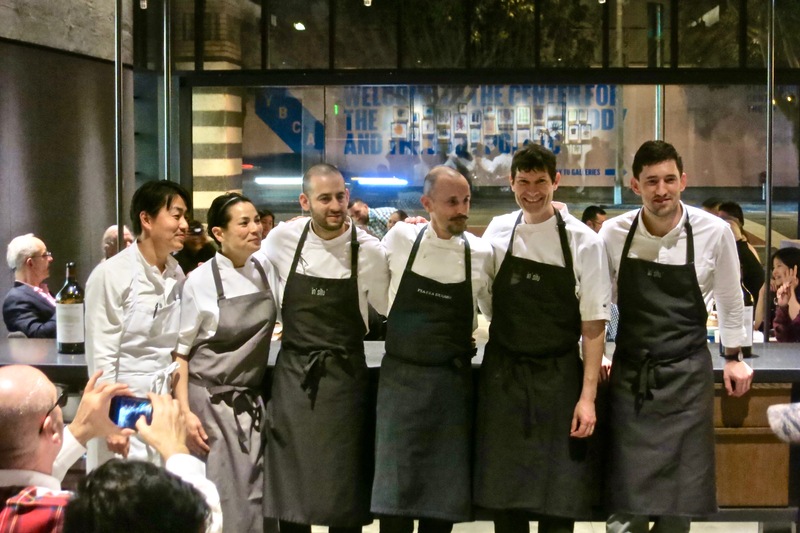 Unfortunately, all things had to come to an end, and we all toasted and cheered for the Ceretto family and the chefs as they all came out one by one. There was naturally a mad dash for everyone to take a photo, but we managed to get one (albeit not a great one). 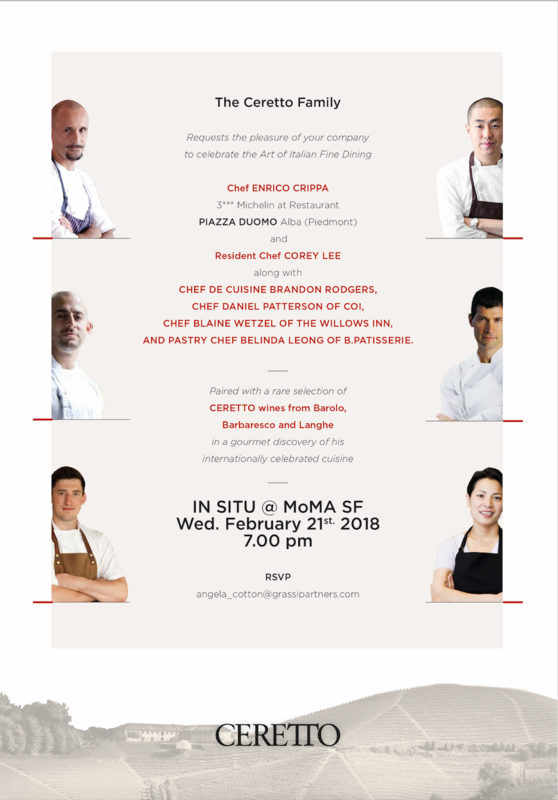 This was truly a unique and unforgettable night, celebrating the Ceretto family, the chefs, and the love for fine art–whether it be in the form of wine, fine art, or gastronomy. From the hospitality and warmth of the Ceretto family, to the culinary masterpieces of the master chefs, and the company of like-minded individuals who accompanied us that night, everything was perfect on this night. May the legacy of the Ceretto reality live on forever. We want to especially thank Angela Cotton of Grassi + Partners PR for extending the invite to us and being nothing short of the most gracious host!